You are currently browsing the tag archive for the ‘Hecate’ tag. 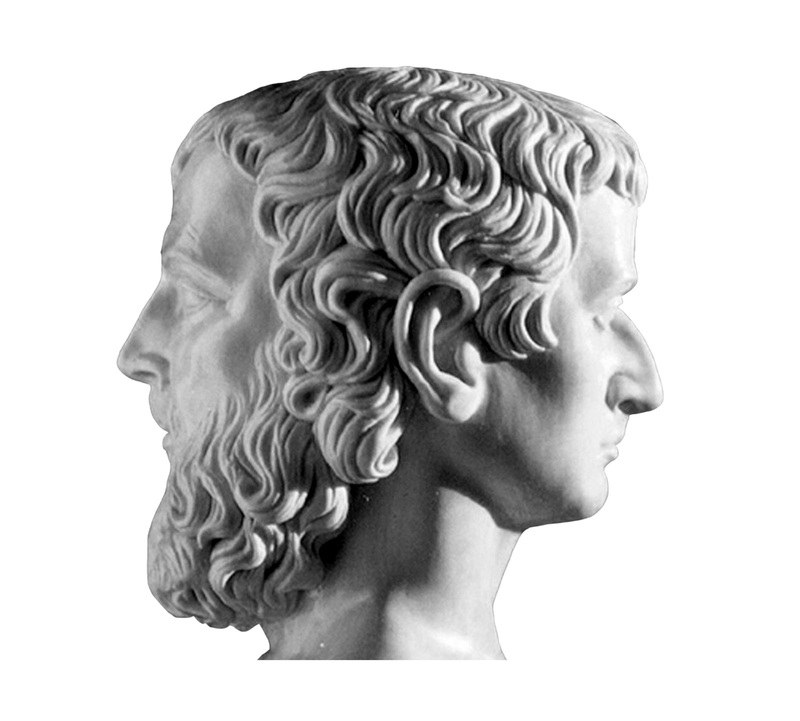 In the Roman pantheon, Janus is the two-faced god of beginnings, limits, doors, gateways, and departure. 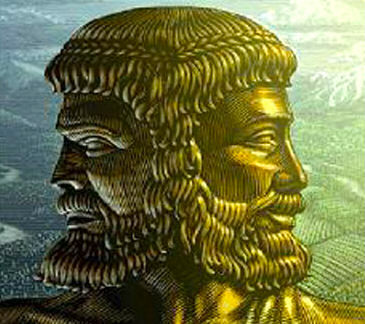 Unlike the other Greco-Roman deities, Janus was not imported from Greece to Rome. How he arrived in the Roman pantheon is unclear: some scholars believe that he was originally a gatekeeping deity of the near East while others argue he was an original Latin deity who was worshipped in Italy before Rome rose to power. Similarly there are different myths concerning his origin. The most dramatic tale of his creation asserts that he was made by Uranus, god of the primal heavens as a love present for dark Hecate. Janus despised being in the underworld so he escaped from Hecate by diving into the river Styx and swimming to the world above. After fleeing the underworld, Janus acted as one of the earliest kings of Rome in the golden era when the titans ruled the world, however at the end of the titanomachy—the epic war between titans and Olympians—he made the poor decision to give shelter to Saturn, hated father of Jupiter. Jove was furious at Janus because of this betrayal and he cursed him with immobility and with a second face. Thereafter Janus stood at the threshold of heaven to open and close the gate as Jupiter came and went. 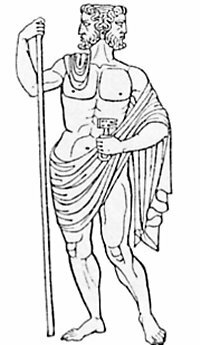 Janus was a popular god for the Romans and they worshipped him whenever they started a new venture or embarked on a trip. January is named after the god and the first day of every month is dedicated to him. The ancient temple of Janus stood in the center of Rome was open during war and closed during times of peace. Since the Romans were a warlike people the temple was rarely closed and sometimes stood open for hundreds of years at a time. When I was young I received a copy of D’Aulaires’ Book of Greek Myths, which I loved. 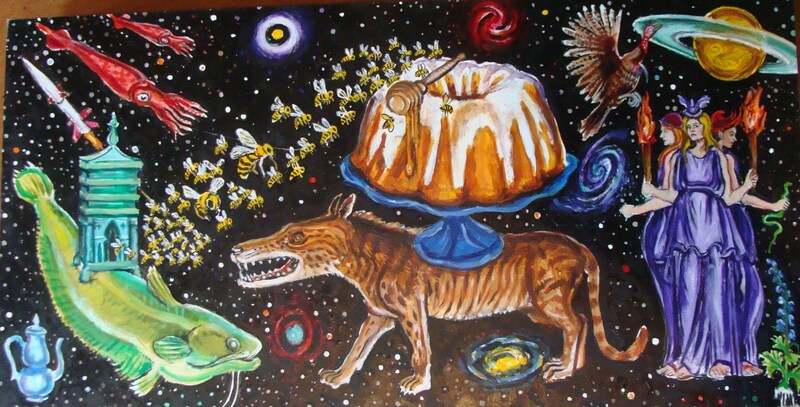 I memorized the characters and stories from the book and suddenly the world of art and poetry opened up to me. The book remains a delightful mythology primer for any child. However, later when I read actual Greco-Roman literature, I realized that D’Aulaire’s had left out a goddess of great importance to the Greco-Roman world (among other things…). The omission seems fitting however, for the missing goddess was Hecate, the goddess of magic, poison, night, thresholds, boundaries, and crossroads. The Oxford Classic Dictionary asserts that Hecate “is more at home on the fringes than in the center of Greek polytheism. Intrinsically ambivalent and polymorphous, she straddles conventional boundaries and eludes definition.” This seems correct. Even in classical passages which hold her in high esteem, Hecate seems to be an outsider among the gods. Her very name means “the distant one”. 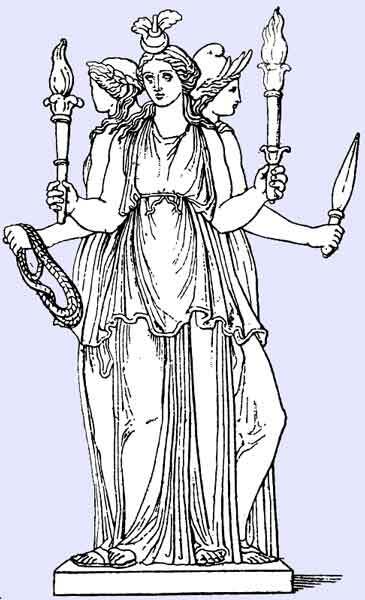 Hecate may seem like a strange outsider in the Greek pantheon because she was an outsider in the Greek pantheon. Some scholars believe she was originally a Thracian moon goddess based, in turn, on an ancient and powerful Anatolian goddess. 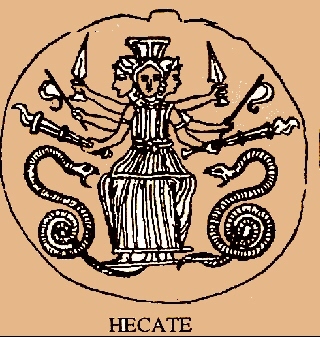 Unlike other outsider gods, who frequently worked their way into the Greek canon as animal demons, Hecate struck a chord with the Greeks and became a focus of their mystery cults. Additionally she had an influential worshipper early on in Greek culture: there are few if any references to Hecate before she appears in the works of Hesiod (a major source of Ionic thought who was active sometime between 750 and 650 BC). Yet in Hesiod’s Theogeny she is a major force of the universe. Perhaps this is because Hesiod’s father was reputedly from Aeolis (a region of Anatolia). It could be that Hesiod was honoring a local goddess, and his writings became instrumental to securing her place in the Greek canon (where she nonetheless remains an alien). for the power surely is with her…. still, for Zeus honours her. Greek writers of the 5th century, maintained Hesiod’s respect for Hecate but they saw her in a darker light. Euripides writes about her as the patron deity of the sorceress Medea and quite a few of that baleful witch’s invocations are directly to Hecate. Whatever Hecate’s origins in the near east and ancient Greece, Hecate had morphed from a moon goddess and protector of the young into underworld queen by the era of Alexander, and that is how she was subsequently worshipped by the Romans (who held her very dear). 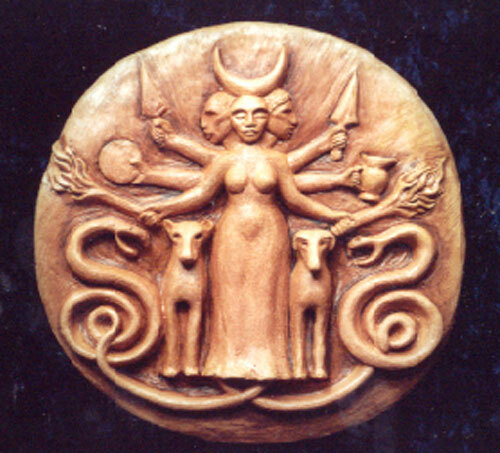 In Hellenic times and afterwards, Hecate is pictured as a triple goddess. Sometimes she has been portrayed with three young beautiful faces, but other times she is depicted as simultaneously being a maiden, a mother, and a crone (which seems to be how her contemporary worshippers see her). Likewise, in one or more of her six arms she always holds a torch. The other items vary between serpents, keys, daggers, ropes, herbs, and mystery charms. Speaking of serpents, she was occasionally portrayed with serpent legs or serpent limbs. The snake was by no means the only creature affiliated with Hecate. 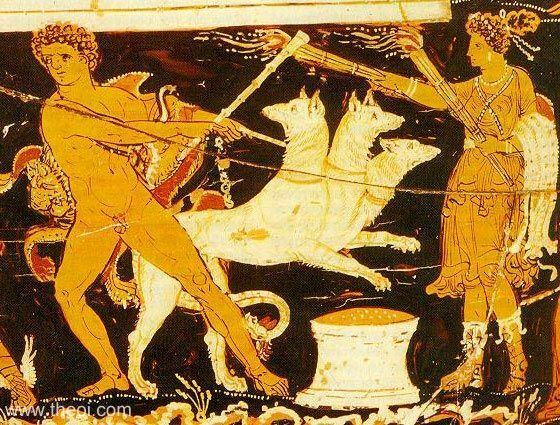 Like many chthonic deities of the Mediterranean, she was associated with dogs (particularly black female dogs). She is said to have had two demon hounds which did her bidding (although it hardly seems important since she was a sorceress of matchless puissance). Additonally, dogs were sacrificed to her and eaten in her honor. Snakes, owls and other nocturnal creatures were variously seen as sacred to the goddess as was the red mullet, a blood-colored goatfish (which wealthy Romans kept in salt water pens to pamper and train as pets). 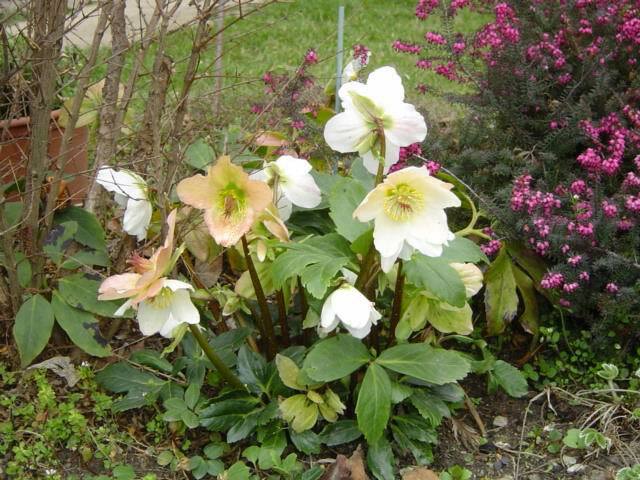 In terms of botanical symbolism, all manner of poisons were her bailiwick and she was invoked by poisoner and victim alike. The yew, with its dark symbolism, was particularly sacred to Hecate, and her worshippers planted them around her temples and mystery cult sites. 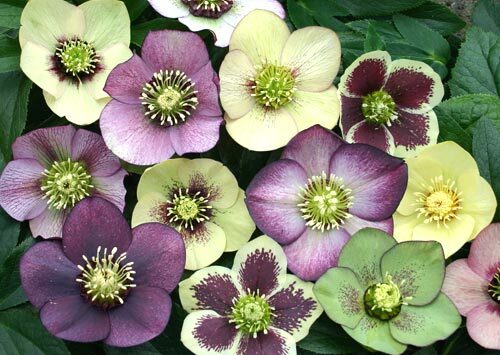 As goddess of thresholds she was called on to help people through the two greatest thresholds. She was worshiped both as a midwife (some say the knife and rope in her hands were for tying umbilical cords) and as a sort of supernatural hospice nurse (some assert that her knife, rope, and herbs could be used to slip into the next realm). Like Athena and Diana, Hecate was a virgin goddess. 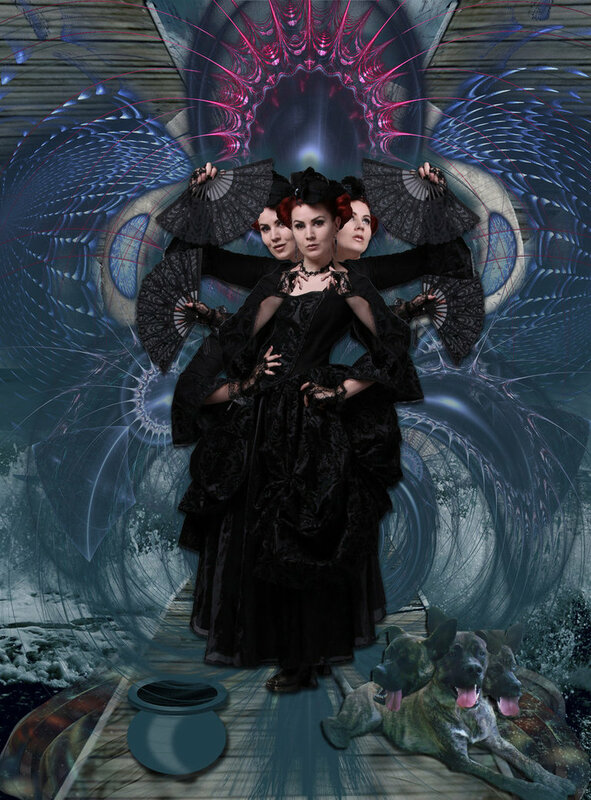 I mentioned Hecate’s contemporary worshipers earlier. Unlike the other Greek gods, who may still inspire artists, poets, and antiquarians but rarely elicit prayers, Hecate continues to have a worldwide following. 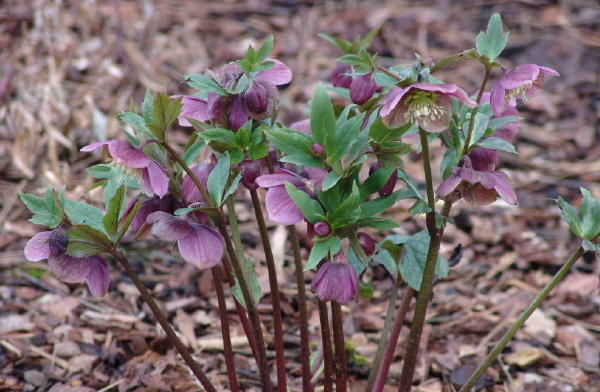 Neopaganism has suited her admirably and she has even appeared in a number of hit TV shows. 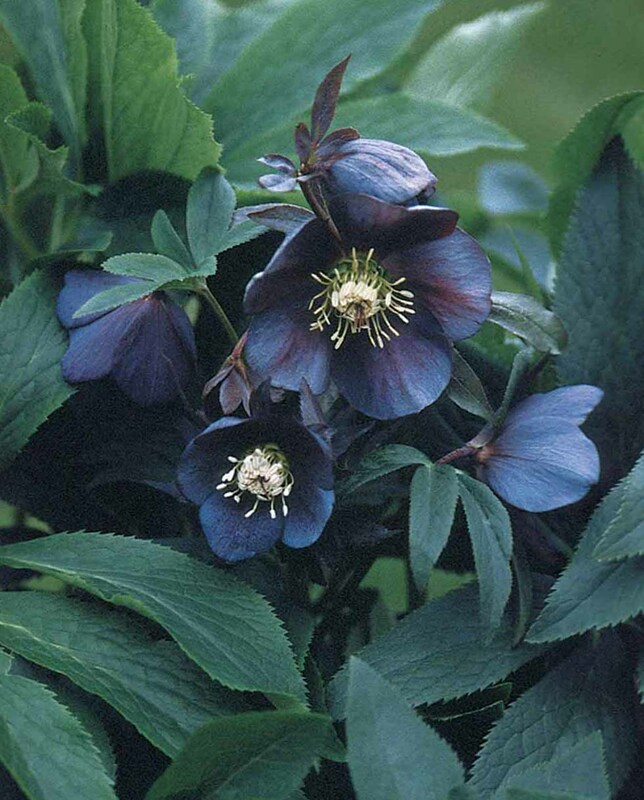 Her mysterious protean nature seems to appeal to the diffuse and highly-individualized practitioners of Wicca. One can only imagine how the surly and chauvinistic Hesiod would feel if told that his beloved Hecate had outlived his beloved Olympian Gods to be worshiped and called on as a feminist icon!